MeetingHero is a responsive web app (currently in private beta) that makes it easy for teams to have highly productive and engaging meetings. Individuals and teams can easily create, update and share meeting agendas in a live, real-time environment on any device. Meeting notes are captured as either agenda items/discussion topics, decisions, action items, open issues, or private notes (not visible to other attendees). This lightweight enforcement of structure allows the capturing of critical meeting details in a meaningful way. At the end of a meeting, you have a single shared meeting summary that you can email to attendees, and is easily accessible under the "Meeting Summaries" page. Decisions, action items and open issues all have their own pages as well so you can easily keep track and follow up on necessary items. 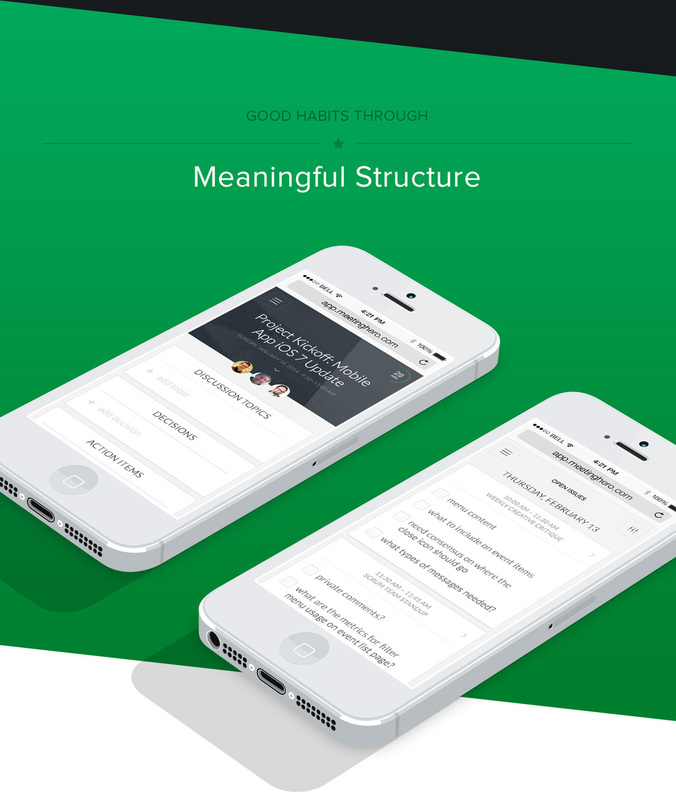 MeetingHero allows you to go into every meeting with a clear understanding of meeting agendas and goals, collaborate in real-time with colleagues in a structured and meaningful way, leave every meeting on the same page with clear meeting summaries that can be emailed and shared, and helps you easily track and follow up on decisions, action items and open issues. You can sign up for the private beta at http://meetinghero.com. Be sure to give feedback on how to help you get the most out of your meetings. 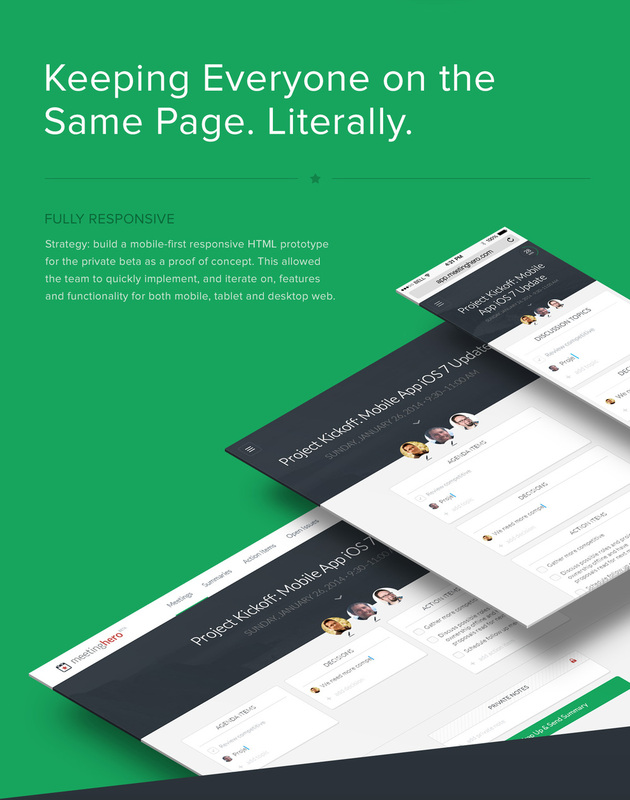 The strategy was to build a mobile-first responsive HTML prototype for the private beta. This allowed us to quickly implement and iterate on features and functionality for both mobile, tablet and desktop. Email is a primary interaction with the product; inviting other meeting attendees to use MeetingHero, sending out agendas, and sharing meeting summaries. I contracted with MeetingHero outside of my full-time obligations at Zendesk. I contributed to overall creative direction, product design and strategy for v1 of the responsive web app through launch of their private beta, which also included basic branding and a simple marketing site. Working with the founders, Val and Dave, was an incredible learning experience and an absolute joy.